and other stuff too uninteresting to go into here, I haven't posted since September. I almost forgot how to do a blog post! Angie chose White as her color. 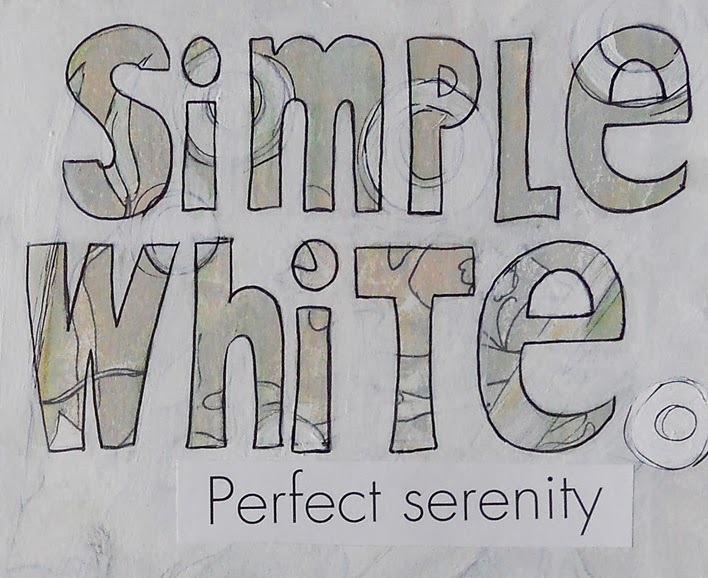 White is simple (sometimes). It's serene and pure, and at first it was a bit intimidating. some color has sneaked (snuck? no.) into my pages. and kept adding other pieces to the page. I had been looking for a chance to use the beautiful Edwardian lady . 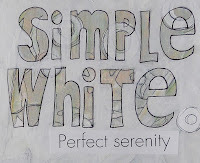 . .
As I was gazing at the next two blank (white) pages a song popped into my head. I've always loved the song "Happiness Runs" by Donovan, and hadn't heard it in years. Somehow, there it was running through my head! You to me are but a passing breeze. 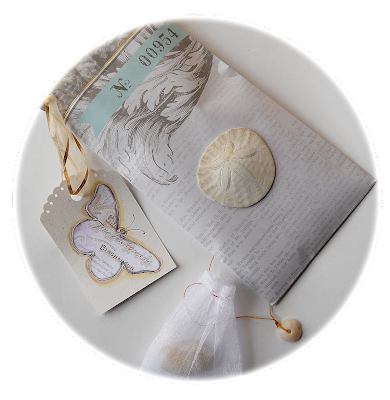 I've included a few sand dollars I found on the beach in Mexico. So sorry I'm late posting this, Angie! I was afraid you might receive your journal back before I completed these pages! Anyhow, only one journal left. and will be finishing it up today! Trying this again- my first comment didn't save. I love, love, LOVE what you chose to do with "white" -all the circles bubbling across your pages incorporating ladies, birds, words and more. This is so elegant and beautifully done! 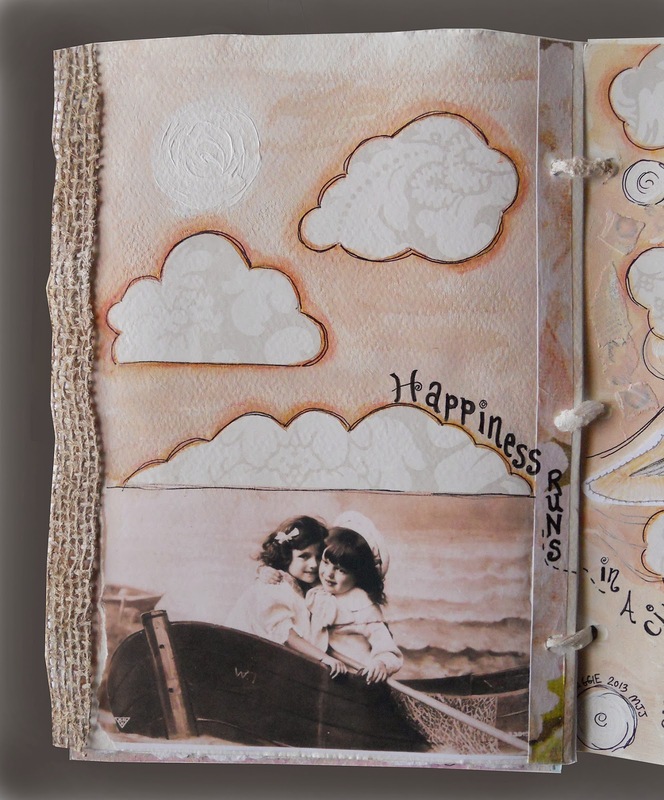 I think (for me at least ;)) Angie's pages were among the hardest to create for, but because of this, her book has some of the most beautiful pages. What a treasure! These pages are gorgeous. I just love Angie's book. White on white is so striking. 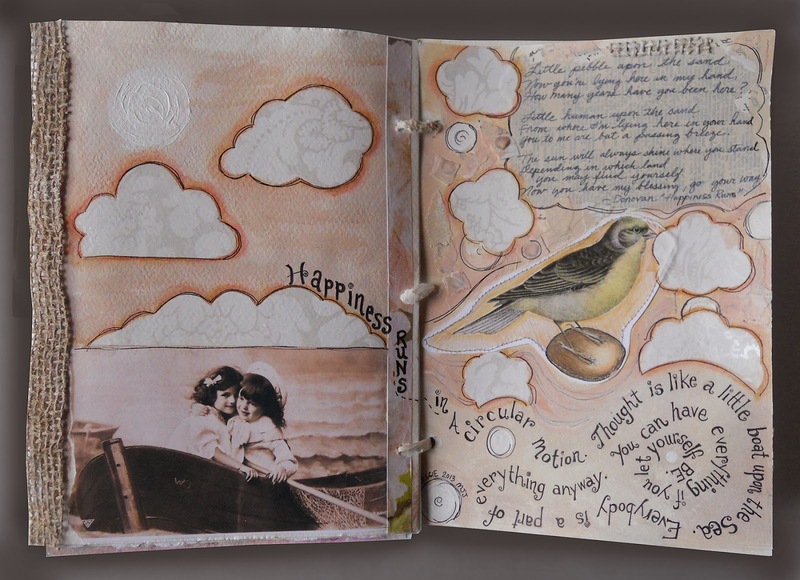 I remember running around singing Donovan's Happiness song....what great inspiration for these pages. First...I say snuck. Now I find out I am talking like a hillbilly...sheesh. And hillbilly is prolly politically incorrect...oh well. You are the best Maggie! I'm always in awe of the way you seamlessly blend collaged/found images with your own painting/art & typography to create inspirational imaginative art. You inspire me, you really do! These are beautiful pages with fabulous words. 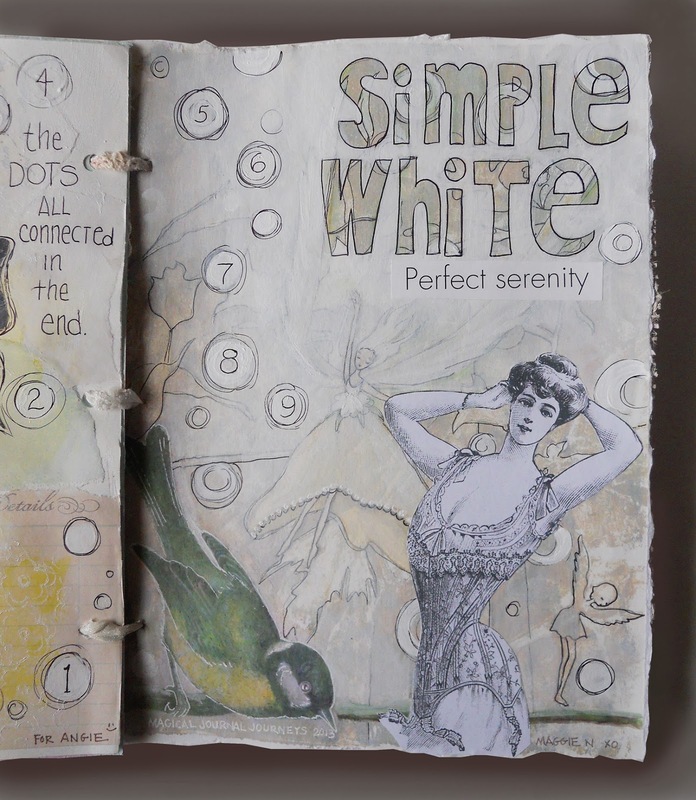 My favourite bits are the effects of the Gelli print & the fairies etc that you found in it, the Edwardian lady & the connecting the dots with the 9 numbers that is so clever. But I love it all. Your artwork as always is awesome! Maggie, I am better with Art than I am with words and I just can never find the right ones to describe how much your work inspires me! 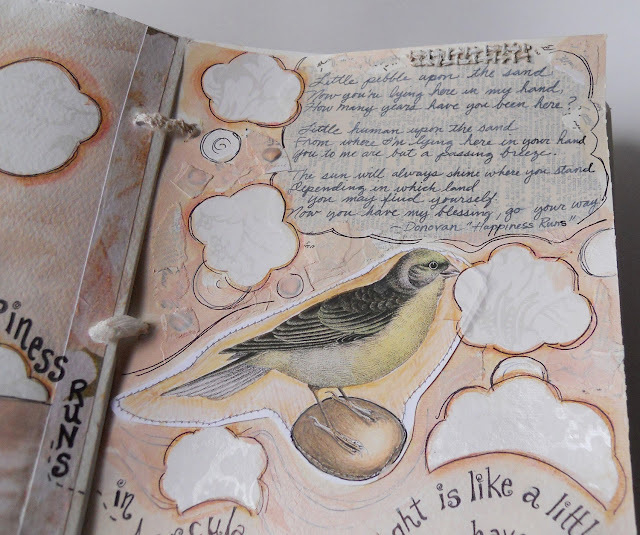 I love stitching on journal pages and I love that you stitched the bird.. Who knew that playing with white could take you in so many directions. 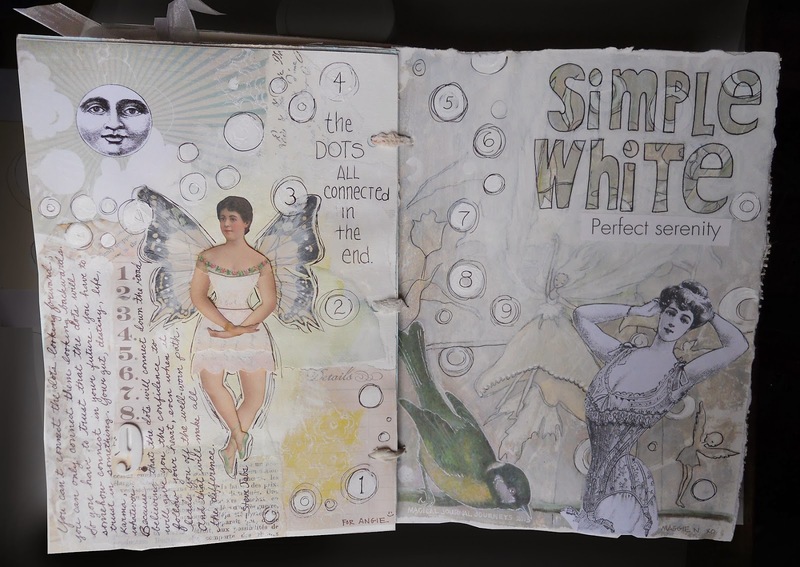 Your pages are such a beautiful addition to her amazing white journal. Love the addition of the shells and the layers of images , Gelli print, weaving in the song, etc. You have definitely connected all the dots here for me! !